Kayakers will line up out of their boats about 100 yards up stream from Carter Rapids on shore. They will safely get into their boats and continue down stream through Carter Rapids negotiating selected gates. First person to pass through all of the selected gates wins. If you miss a gate you are disqualified. Sponsored by Next Adventure who has generously donated gift certificates for the top three finishers. 1st place: $200 gift certificate, 2nd place: $100 gift certificate, 3rd place: $50 gift certificate. 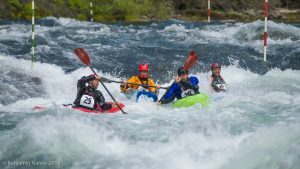 This is a points event for the Western Whitewater Championship Series.